Is it just me, or does this seem patently unfair to the other 28 teams? 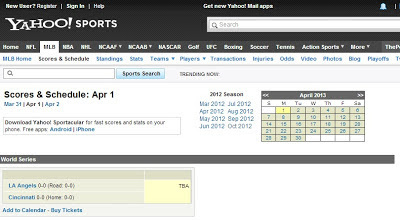 Good to see that Yahoo! is well-prepared for continuous interleague play in 2013. The 2012 positional RG averages demonstrate a fairly remarkable convergence near 4.8 for a number of positions (third base, the three outfield spots, and DH all between 4.75-4.85). While this is nothing more than a one year data fluke, it’s the kind of thing that is fun when you find it. One thing that has persisted is left fielders being outperformed by their stronger armed brethren in right, although 4.8 RG represents a bounce back from their pitiful 4.45 performance in 2011. The other most notable position performance came from backstops, who were close to league average and outhit the middle infielders. For an odd but meaningless fact, note the excellent stolen base record of DHs--their 80 SB% was the best of any position. An eighteen run range between the best and worst team pitchers is pretty common. Washington’s pitchers were clearly the best, leading in both batting and secondary average. Cincinnati’s BA was only five points lower and they tied for second in isolated power (behind Milwaukee), but only San Diego’s pitchers had a lower walk rate than the Reds. At the other end of the power and overall offense spectrum was Pittsburgh. They were last with a -.7 RG and -8 RAA, but their isolated power was a woeful .003 (the next lowest was Houston at .018). Pittsburgh pitchers mustered just one double in 290 at bats--I didn’t check, but it’s tough to imagine any teams in history have topped that. AL pitchers in aggregate came pretty close, though, with just three doubles in 282 AB (.011 ISO). All AL teams had a pitcher reach base safely except the Tigers, but their 0-13 was offset by seven sacrifices to lead the AL. The best hitting pitchers were Cleveland with a .290 across-the-board slash line (six singles in 21 at bats). Kevin Youkilis takes a bad rap here as he had a respectable 720 OPS in 316 PA as the Chicago third baseman; his teammates combined for 466 in 339 PA. If you endeavor to score 1,000 runs for the season, it might be a good idea to make sure that you don’t get the worst offensive production out of two of your positions. No amount of corner power can mitigate that. Although Pittsburgh’s left fielders were the worst in total value relative to their position, Seattle’s shortstops had the overall worst performance with 2.5 RG. They were actually matched in production by their team’s pitchers, who hit a raw .227/.261/.273 for 2.5 RG (the park adjustment should not be applied to AL pitchers because all of their PA--except for rare cases that tend to involve Joe Maddon--come on the road). Obviously the pitchers’ performance came over a microscopic 23 PA, but it’s a factoid with some nice shock value. The Reds got their best production out of first base and the corner outfielders, and their middle infielders and catchers had relatively low RGs. Only center field produced contrary to expectation in a meaningful way. The Indians, on the other hand, got no offense from first base and left field. While right field was productive as would be expected, the other top positions included the middle infielders and catcher. Perhaps it’s my experience as an Indians fan speaking, but I feel that the type of pattern displayed by the Indians in recent years is the most frustrating as a fan. Cleveland has gotten solid production from catcher (Martinez/Santana), second base (Kipnis recently), shortstop (Peralta/Cabrera), center field (Sizemore/Brantley)...and has struggled to find first basemen (Garko/LaPorta/Kotchman) or left fielders (Michaels/Duncan/Damon/etc) who could provide league average (overall, not even relative to position) production. Washington led the NL in infield RAA, with excellent performances from first base and shortstop. The Desmond-led shortstops stood out enough to lift the Nats to the NL lead in middle infield RAA, and they just missed leading in corner infield RAA as well. The worst production from corner infielders in the NL was a dead heat between the Phillies and the Marlins. Miami joined Cleveland and Seattle as the only teams with -20 RAA performances from both first base and left field. St. Louis and Milwaukee boasted the top two outfields in the NL; the Brewers had the best production from corner outfielders in the majors, but St. Louis’ average production in center field gave them a higher composite RAA. Cincinnati’s offense was a conundrum, ranking fourth to last in the league in park adjusted R/G. Their component performance was better than that, but even so one might have expected more than a composite 20 RAA from their positions. The Reds’ center fielders were dreadful, though. Leading the majors in first base RAA may seem surprising at first glance, but much of Frazier’s hot stretch came as Votto’s replacement (884 OPS in 149 PA). Pittsburgh’s middle infielders ranked last in the NL, but at just -15 RAA. Houston was last in the majors in corner outfield RAA and their center fielders were only one run worse than Cincinnati’s for a total of -75 outfield RAA, 29 runs worse than the next sorriest outfit. That outfield belonged to the Cubs, who were also last in the NL in corner infield and overall infield RAA. San Francisco’s offense was a wonderful example of above-average balance plus the MVP, enough to rank third in the league in RAA. Chase Headley powered the Padres to the NL’s highest corner infield RAA. New York led the majors in middle infield and overall infield RAA. Boston’s outfield was the worst in the AL, and just two above average positions speaks to how poorly their season went. The amount of red on this chart is fairly staggering given the extent to which the media still hypes the difficulty of pitching in the AL East. Detroit’s much-hyped duo contributed a whopping 90 RAA to lead corner infielders, but the black hole at second base gave 27 runs back, and the lack of any other standout positions aside from center once again reinforce just how stupid it was to mention “1,000 runs” and this team in the same sentence. Their corner outfielders were last in the AL in RAA. Minnesota was last in the majors in middle infield RAA, while Cleveland achieved the same with their corner infielders. In fact, despite Detroit’s 90 corner infield RAA, the division combined for -11 RAA from corner infielders as only Chicago got above-average production from either position. Los Angeles led the AL in corner outfield RAA and the majors in total outfield RAA. The lack of offense in Seattle is as predictable as the rain and the votes for liberals, but marveling at it never gets old (unlike the other constants of Seattle life). Their corner outfielders were last in AL RAA and their infielders last in the majors. Only their catchers, led by John Jaso, were above average. Switching gears to some technical explanation, the position adjustments I am now using are based on comparing each position’s RG to the overall major league average. 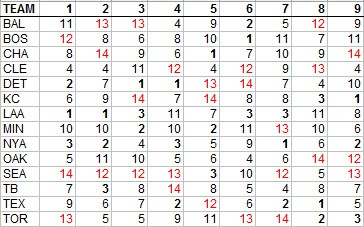 Previously, the adjustments I used were based on comparing each position to the league average with pitchers removed. The latter comparison is certainly cleaner, but it was inconsistent with how I was actually calculating RAA and RAR, which was comparing each player to the overall league average. The new method is not perfect either; one could very persuasively argue that pitchers hitting should be removed from the league average for all computations. I’ve always subscribed to the notion that the league totals for any average-baselined stat should be zero, and that the league average should be the same whether one is comparing players or teams. If you take out pitchers from the league average, but leave them in for teams (and pitcher hitting does factor into actual team offensive output, even if the variance is much lower than for other positions), then you wind up with a league which rates as below average offensively. Of course, the notion of looking at the leagues as self-contained units made much more sense when they were. Now the AL averages include not only pitchers hitting, but also performances compiled against NL teams. I cling to the notion of separate leagues for computational purposes because the separation is still great enough that it’s a better approximation than lumping both leagues together, but both are imprecise. This is a particular problem for positional adjustments, because the AL average and the NL average include different proportions of pitcher’s hitting. In the pre-interleague days, even if one tied themself to using the league average including pitchers, it may have made sense to use a PADJ tied to all positions for the NL and less pitchers for the AL. I choose not to complicate things by using a different set of positional adjustments for each league, especially now that both choices are at least partially incorrect. This imprecision does not cause huge distortion, but I need to disclose it nonetheless. NL #3 hitters retained the highest RG of any league-slot for the fourth consecutive year. 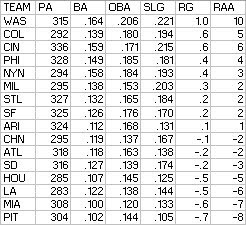 AL teams were more balanced between #3 and #4, with the cleanup hitters holding a slight edge in RG built on BA (.275 to .264) but slightly less power (.189 to .193 ISO). 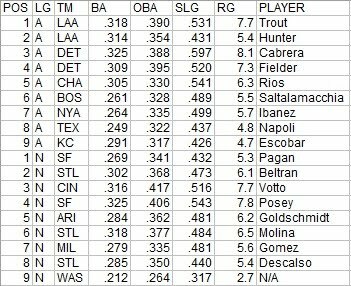 NL leadoff me had a lower OBA than any other NL slots except 7, 8, and 9, and the #7 hitters managed to exceed their overall production (if you remove the Reds leadoff hitters, they did muster a higher RG than the #7s). 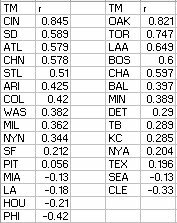 AL teams were much better at leadoff, but gave those gains right back with poor #2 hitters. A few teams had the best production in their league at a pair of slots that are considered particularly important--the Angels at #1/2, the Tigers at #3/4, the Giants at #1/4. But the Cardinals got the best production of their NL rivals from #2, #6, and #8. The Astros and Royals both had two black holes in the middle of their order while the Chicago teams each trailed at #2 and a lower lineup position. Note that even in this lousy company, the Reds leadoff hitters had the worst OBA among the other league-worst positions except for the Pirates #9. 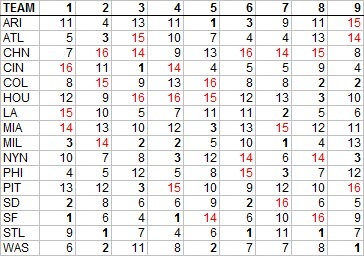 Even when you compare to the average for each slot, the top RAA figures are dominated by the expected slots. Please don’t use the fact that Trout outshone his leadoff peers by more than Cabrera outshone his #3 peers to bolster an MVP case--that would be silly on principle, and the performance of other players are include in the team figures reported here. I wrote enough about Cincinnati’s leadoff hitters in an earlier post, but to pile on: their 2.6 RG was worse than any non-#9 spot for any other major league team. It was worse than the #9 slot of all but one American League team (CHA), making it the second-worst non-pitcher slot in the major leagues. Washington’s #9 hitters outhit Cincinnati’s leadoff hitters (2.7 RG to 2.6). They also had the 13th lowest walk rate of any position (8th lowest excluding NL #9s). Their OBA was 15th lowest of any position--and rock bottom when NL #9s are excluded. I marveled a few times during the season at Dusty Baker’s choices at the top of the order, but I had no idea that it was this bad until digging into the numbers. Last year this chart for Boston was filled with bold--this year they ranked in the bottom half of the AL in six of the nine spots, and only the #6 hitters weren’t borderline. Not much has changed in Seattle, except last year their ineptitude was centered at 4-6 rather than 1-4. Based on talent or actual performance, Cincinnati had no business finishing fourth last in the NL in park-adjusted R/G. But that outcome starts to make a little more sense when you consider the leadoff disaster coupled with poor production from the cleanup hitters (.263/.323/.428). Follow this link for the full spreadsheet. This post is probably shorter than in past years, which is good for you if you choose to read. There’s not much of substance here--just a few observations about quirky things in my stat reports that happened to catch my eye. Jayson Stark-level stuff, but with better (I hope) stats. * If I could only know one statistic regarding each major league season, I would want to know the league average of runs per game. It is the simplest way to boil down the environment in which the game is played into a single number. As such, I like to make note of how it fluctuates from year to year, even if one cannot draw any conclusions about long-term trends from single seasons. In fact, I consider this number so important that I refer to it as N in my league stat report. Runs were up slightly in the majors in 2012 relative to 2011, with an uptick in NL scoring leading the way. N for the 2012 was AL was 4.45 versus 4.46 in 2011, but the NL’s crept up to 4.22 from 4.13. I should note that interleague play has made it more difficult to look at N for each league, since runs no longer equal runs allowed for the league. The version here is just runs scored, which I persist with by convention and expediency rather than anything I can justify to you. * Home W% also rebounded a bit after cratering in 2011. Home teams won at a .533 clip in 2012, up from .526, but well behind the conspiracy theory-inspiring .559 of 2010. Four of thirty teams had better record on the road, while there were seven such teams in 2011, and just two in 2012. Again, trends need to be observed over time. * As the Rays fell out of contention in September, one factor that was bandied about in mainstream circles was a decline in their team fielding. It’s true that Tampa went from leading the majors in modified FA in 2011 (.978) to bringing up the rear in the AL in 2012 (.963), but their DER remained excellent. Tampa’s .694 was good enough for a virtual five-way tie for the ML lead (SEA, LAA, OAK, and WAS were all at either .695 or .694). And the Rays pitching was outstanding; they narrowly missed leading the majors in both starter (their 3.90 led the AL by a large margin as DET was second at 4.26, but WAS was at 3.85) and reliever eRA (the closest challenger to their 3.19 was the Reds at 3.44). - COL got quality starts in just 17% of their games (Coors doesn’t help QS% of course, but regardless of the park, you don’t get a quality start without pitching six innings); MIN was next lowest at 38%. - COL starters had a 5.71 eRA (this figure is park-adjusted), but it was not the worst in the majors. That fate belonged to...the Twins (5.73). * The four lowest scoring teams in the majors played in the National League, which isn’t shocking, but the fact that every AL team outscored the Reds was very surprising to me. CIN’s 4.05 R/G was well ahead of their two division rivals, at least--Houston (3.64) and the Cubs (3.67) brought up the rear, and Miami didn’t do much better (3.76). The Marlins and Reds were the two most underachieving offensive teams in terms of scoring fewer runs than predicted by Base Runs, with respective shortfalls of 47 and 40 runs. Of course, that means the fifth lowest-scoring offense belonged to an AL team, and if you’ve been paying any attention at all over the last few seasons, you should guess that it was Seattle. You’d be right--the Mariners mustered just 4.06 R/G, which was actually better than their RC/G (4.04). Seattle was last in home R/G (3.17--the Mets were next at 3.54), but ranked eighth in road R/G (4.47; for reference, TEX was at 4.46). The Mets were also much better on the road, ranking seventh just ahead of Seattle with 4.48. In case you were wondering, the home and road R/G are raw numbers. The two teams that jump off the page for me are the Tigers and the Giants. All season I had a good time snarking at the expense of those wild-eyed dreamers who thought that Detroit might have a chance at scoring 1000 runs, and in fact the Tigers were below the AL average in R/G after adjusting for park. It would have seemed difficult to believe two years ago that San Francisco would win another World Series but do it with the offense contributing more than the defense. * The Mets factoids provide a great segue into discussing Citi Field’s park factor. When significant changes are made to a park, my usual course of action is to treat it as a brand new park. This is not an entirely satisfactory solution, but neither is regressing a park to 1.00 as my methodology also does. One could attempt to develop a hypothetical mean for a park, considering factors such as dimensions, altitude, temperature, knowledge about how the park played before alterations, and other factors. My approach keeps it simple, but not necessarily more accurate--deal only with the park under its current dimensions, use a maximum of five years of data in whichever direction (past or future) that you can grab it from (although 2012 park factors are necessarily 100% based on past experience at this point), and regress heavily. Considering only 2012, I have Citi Field’s park factor as .96 for runs and 1.02 for home runs. If instead I’d used all four years of available data (2009-2012), it would have been .96 and .95. In this case, regardless of how I figured the park factor, it wouldn’t have made any difference for Mets players. Kimbrel and Chapman are in video game territory, but the most surprising name to me is Jason Grilli. 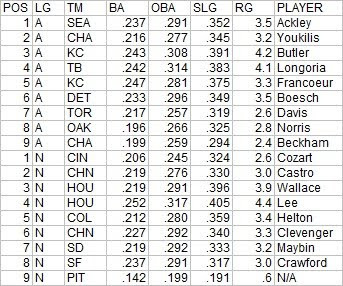 What I list as KG and WG are strikeouts and walks per plate appearance, scaled to the league average of plate appearances per game. I’ve always advocated looking at strikeout and walk rates per PA rather than per inning, and am happy to see that PA-denominated rates have gained a lot of traction in stathead circles (if you think I’m implying causation between the two causes of this sentence, I’m not). Why have I chosen to scale them to PA-games rather than just leaving them as per PA proportions or percentages? For the same reason I express batter’s RC rates as per 25.5 outs rather than per out--I have a much better feel for the per game scale, and since it’s only a scalar multiplication, there’s no harm done in terms of the ability to make comparisons . Using the actual league average of PA/G can admittedly create some odd results that don't occur when using outs/game. Outs/game are generally fixed across leagues, but PA/G can vary significantly across contexts. The same is true for K/9. If K/PA is constant between two entities, K/9 will be higher for the entity with a higher average of PA/G (this is the biggest reason I dislike K/9). So the KG figures I report will rank an AL pitcher with the same K/PA ahead of a comparable NL pitcher. I don’t really consider this a problem, since I’d recommend using adjusted statistics when comparing across leagues anyway. But I can see why for some might find that objectionable for a single season; perhaps next year I’ll use the major league average PA/G to set the scale. * I am easily amused by teams whose estimated W%s are roughly equal and pitchers whose various run averages are similar. A great example of the latter this year was Josh Johnson. Johnson’s RA was 3.95 and his bullpen support was pretty average, so his RRA was just a touch lower at 3.90. He didn’t allow many unearned runs, so his 3.81 ERA was pretty close to his actual RA. His eRA was 3.81, so his peripheral statistics were in line with his actual RA. And his dRA was 3.90 thanks to his .304 %H being right in line with the NL average of .303. * Remember when Aaron Cook was a nightmare for sabermetrics? The trashiest site in sports media was all over that case, but in the end, not only was Cook unable to sustain success with a 1.9 KG (and who could have ever forseen that? ), his .295 %H was indistinguishable from the AL’s .296 average. And his 5.89 dRA was equal to his 5.89 RRA. Aaron Cook 2012 could be the DIPS poster child. Speaking of former DIPS debunkers, how did JA Happ manage to get his strikeout rate up to 8.6? * Major league pitchers with 15 or more starts who averaged at least 100 pitches/start (treating stray relief appearances as half a start): Homer Bailey, Clay Buchholz, Madison Bumgarner, Matt Cain, Johnny Cueto, Yu Darvish, RA Dickey, Yovani Gallardo, Dillon Gee, Gio Gonzalez, Miguel Gonzalez, Cole Hamels, Aaron Harang, Matt Harrison, Felix Hernandez, Phil Hughes, Ubaldo Jimenez, Josh Johnson, Ian Kennedy, Clayton Kershaw, Cliff Lee, Tim Lincecum, Justin Masterson, Jon Niese, Jake Peavy, David Price, CC Sabathia, Chris Sale, Max Scherzer, Jamie Shields, Jason Vargas, Justin Verlander, Edinson Volquez, CJ Wilson. You are more than free to quibble on this, but the name that really jumps out to me on that list is Dillon Gee. I would argue that the other pitchers on the list pitched very well in 2012 (even if that was a surprise, as in the case of Miguel Gonzalez) or had a reputation (like veteran workhorse Aaron Harang or whatever-the-heck-he-is Ubaldo Jimenez). And Gee only made 17 starts, so his workload was not comparable to the pitchers who were in the rotation all year. Still, Gee was -8 RAA in 2012 and -13 in 2011. His teammate Jon Niese may have caught your eye as well, but what’s really interesting is that both Gee (103 pitches/start) and Niese (101) actually threw more pitchers per start than their knuckleball and Cy Young contender teammate RA Dickey (100). The Indians pitching in general was awful. I wrote a little bit above about the horrible starting pitching of Colorado and Minnesota, but Cleveland was right behind. The Indians 5.64 IP/S trailed only those two and Kansas City, their 45 QS% was sixth-lowest in MLB, and their 5.65 starters eRA trailed only the terrible two as well (fourth-worst was the Royals, again, but with a relatively Verlanderesque 5.29). Cleveland allowed 5.58 runs/game on the road, worst in the majors (Houston was next at 5.42; Minnesota next in the AL all the way down at 5.12). Not that they were much better at home--4.85 RA/G was the fourth-most (Colorado was worst, of course, with 6.46). At least two were above replacement level. 77 primarily AL pitchers made 15 or more starts, and in terms of RAR, the Indians boasted six of the bottom nineteen. Obviously Manny Acta’s fault. * Adam Dunn hit .204 this year, which was a bit of a disappointment to me. Throughout the season, I was hoping that his final average would slip below the arbitrary Mendoza line in order to have a legitimately solid batting season at that BA level to point too (Dunn was +12 HRAA). It is a bit of consolation that his park-adjusted BA is .199, and that his .445 secondary averaged led all AL hitters with 400+ PA (Jose Bautista and David Ortiz each had a higher SEC and were close to that cutoff). Dunn also came tantalizingly close to breaking the strikeout record, but his 222 fell one short of Mark Reynolds’ 2009 total. The only appreciable difference is in the shape of production, with Rizzo posting a higher BA and LaHair a higher SEC. If Ned Colletti knew what secondary average was, he might be concerned. Looking at just their offensive contributions, you can see that they were equally effective when in the lineup, albeit with a shape difference (player A had a superior BA, player B a superior SEC). Obviously Player A was in the lineup every day, while Player B missed some time. It isn’t reflected here, but Player A also “played” a tougher fielding position. All told, though, there appears to be little good reason why Player A is still celebrated and Player B is reviled. Don’t overthink this one--you know who they are. Listed in parentheses after a team are all players that appeared in twenty or more games in the leadoff slot--while you may see a listing like "ATL (Bourn)” this does not mean that the statistic is only based solely on Bourns's performance; it is the total of all Atlanta batters in the #1 spot, of which Bourn was the only one to appear in that spot in twenty or more games. I will list the top and bottom three teams in each category (plus the top/bottom team from each league if they don't make the ML top/bottom three); complete data is available in a spreadsheet linked at the end of the article. There are also no park factors applied anywhere in this article. Detroit’s leadoff hitters performed very well in context-neutral measures as you’ll see, but you also are well aware of the biases inherent to runs scored, and having Cabrera and Fielder to drive you in is nice. Likewise, Jose Reyes had a fine season, but Miami didn’t score any runs (also, Reyes was only in the leadoff spot for 95 games). The five point margin between the leadoff and overall OBA is in usual range, perhaps a little on the low end (the gap was seven points in 2011 and two points in 2010). The point of this chart--the Reds leadoff hitters were really, really bad. In my last post, I wrote about how bad Cincinnati’s offense was. On paper, it should have been much better, and hemorrhaging outs at the top of the lineup was certainly a contributing factor. Dusty Baker was content to allow Zack Cozart to make an out three out of every four times from the leadoff spot. To be fair, Cozart’s low OBA was a bit of a surprise, but there was nothing in his record that suggested that he would be a good leadoff option. Angels leadoff hitters led the majors with 30 homers (PHI was next with 24), but their advantage in getting on base was large enough that even with home runs removed as times on base, they still led the league in ROBA. Again, this is not a quality list, as indicated by Cincinnati leading the way. While Cozart and Co. may have been terrible, at least they avoided driving in any runs so as to upset the traditional leadoff profile. What’s interesting here is that Cincinnati’s leadoff hitters did not really fit the traditional profile despite failing to drive in any runs. The Reds had the lowest RER as their leadoff hitters drew the fewest walks (37) and stole the fewest bases (10) of any team. Even so, their RER denominator wasn’t very good, as their isolated power of .119 was still below the leadoff average of .130. While the Reds only stole 10 bases from the leadoff spot, they were only caught once, so their net 8 was essentially average. The Yankees were next with just sixteen attempted steals. If Chris Young’s basestealing attempts are not toned down in Oakland, then the media may get its moment to declare that Moneyball is dead. It’s not a surprise that 2OPS and RG produce similar results. Finally, allow me to close with a crude theoretical measure of linear weights supposing that the player always led off an inning (that is, batted in the bases empty, no outs state). There are weights out there (see The Book) for the leadoff slot in its average situation, but this variation is much easier to calculate (although also based on a silly and impossible premise). After reviewing all of these metrics, I reach two major takeaways--namely, there were two teams that got historically notable production out of their leadoff spots. On the plus side were the Angels; fueled by Mike Trout, they swept all of the quality categories--even net steals, which are a plus but not an imperative, even for a leadoff hitter. Sometime if I am bored, I will do a retro version of this post looking at 1985 or 1990--vintage Rickey/Raines seasons, which would probably produce similar dominance to what Trout did in 2012. On the negative sides, Cincinnati’s leadoff hitters were really awful. As Howard Medgal pointed out to me, it’s a good thing they have Billy Hamilton on the horizon. Follow this link for the spreadsheet with full data. There have been way too many words written about the AL MVP race already. I’m pretty sure that I don’t have any perspective to offer that you have not already had the opportunity to read from someone else. Nonetheless, I will run through a perfunctory comparison of the top two candidates and then address a couple of other side issues that the discussion has raised. Mike Trout by my estimation created 131 runs, adjusted for park (the key word in that sentence is “estimation”). Miguel Cabrera created about 133 runs. Trout did this while making 382 outs; Cabrera while making 418 outs. It does not take any advanced understanding of sabermetrics to conclude that two less runs in 36 less outs is a tradeoff that would benefit a team. This is before considering the fact that Trout is an excellent center fielder and baserunner and Cabrera is a third baseman of questionable ability and is not going to add much of anything on the bases. It’s pretty clear that Trout is ahead before any factors not captured in the statistics are taken into account. If you want to poke holes in that perfunctory analysis, one place you might start is the park factors. I estimate that Angels Stadium has a park factor of .96 and that Comerica Park has a park factor of 1.02. I don’t want to get into a debate about the park factors themselves, but rather I’ll assume for the sake of argument that both parks were neutral. After making that change, I estimate that Trout created 125 runs and Cabrera 136. Instead of a two run difference over 36 outs, we now have an eleven run difference over 36 outs, which suggests that Cabrera was the more valuable offensive player. Of course, the aforementioned fielding and baserunning is more than enough to preserve the choice of Trout as more valuable before subjective factors are considered. * It has become surprisingly common to see sabermetric-minded people suggest that leadoff hitters should have their RAR discounted in some manner due to the extra plate appearances they get due to their role. I don’t know how widespread this view is, or where exactly it got started, but I find it quite odd. My conception of value holds that if a player is used or is able to take advantage of his talents in such a way as to increase his contribution to the team, then he should be credited for this added value. One example is a hitter than can exploit his home park. Some people would look at the hitter’s home/road splits and discount his value accordingly. I would only discount his home stats to the degree to which the runs have a lower win value (in other words, use a runs-only park factor). 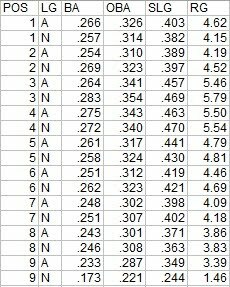 In order for me to believe that a leadoff hitter should not get credit for the additional PA he takes, you would have to demonstrate to me that his average PA had less win impact (production as measured by context-netural metrics being equal) than the average PA of the lower in the order hitter. Before you conclude this would be easy to do, I’d invite you to read the point I made about leverage and relievers in the Cy Young post--I don’t believe it is necessary to limit value to a real-time perspective. This applies within innings as well as within games. In Trout/Cabrera, though, the real-time perspective measure of RE24 (real-time on the inning level) does not even support the contention that Cabera’s batting order position meant he had a greater impact. Fangraphs’ context-neutral wRAA has Trout at +48, while their RE24 for Trout is +54. Cabrera is +57/+47. So even if I were to accept the premise, I’m not sure how this is supposed to help Cabrera. *An argument that was oft-cited but got less traction with saber-minded folks was the notion of “penalizing” Cabrera for playing third base. This argument holds that Cabrera made a noble sacrifice for the good of the team to play third, which allowed Detroit to sign Fielder and improve the team. Off the bat, I reject the notion of crediting a player for allowing another to be signed, because it removes the focus from the player’s on-field contributions and opens a Pandora’s box of circumstantial arguments that could not be objectively evaluated or even fully documented (just as a hint of where this road could end up leading, compare Cabrera and Trout’s salaries--or the fact that Fielder was signed after Victor Martinez’s injury, which means that Cabrera’s sacrifice, at least for 2012, allowed Delmon Young and his pitiful 3.9 RG to play every day at DH/LF). Setting that portion of the debate aside, the RAR figures I use do not account for fielding, so any penalty that Cabrera takes for playing third base can only be added after the fact. Playing third rather than first earned Cabera 7 RAR. Even if Cabrera is an average third baseman (and I don’t think his backers would claim much more than that), it’s hard to spin this into a positive compared to Trout. * I’ve seen the argument floated that Cabrera has been a great player for several years and has not won an MVP award; this may be his last best chance while given Trout’s age, he may have many MVP opportunities in front of him. The primary reason I disagree with this position is that the MVP award is a single-season award, and as such I believe that the criteria should be a good faith evaluation of which player was more valuable in the season in question. If the award was a true talent award, then certainly Cabrera’s track record would be relevant, and in fact if I could choose one of these players for my team in 2013 (with no consideration given to anything beyond 2013), I would take Cabrera. But that’s not the criteria suggested by either the voting instructions or consensus of interested parties. More generally, I call this the Zenyatta argument. Zenyatta won Horse of the Year in 2010 over Blame despite there being no way to argue that Zenyatta had a more impressive 2010 campaign than Blame without twisting one’s self into knots. But Zenyatta was a great mare of historical significance who had been edged out for the award by Curlin in 2008 and Rachel Alexandra in 2009 (in those years, I believe that a very reasonable case could be advanced for Zenyatta, but ultimately agreed with the selections of Curlin and Rachel Alexandra). It was seen as unfair that a horse as accomplished as Zenyatta would never win Horse of the Year. I find this argument utterly unpersuasive. Miguel Cabrera has been an excellent player over an extended period, which is why he ranked fourth on my IBA ballot in 2006, tenth in 2009, second in 2010, second in 2011, and second in 2012. There’s no shame in being the second-best player in the AL or the second-best horse in the country for three years running--it's a more impressive achievement than being MVP one year and not on the ballot in the other two years. But it doesn’t entitle one to the MVP in any given season. With respect to the “Trout is young and will have many more chances” component of the argument, we’d all like to think this is the case but you never know. Al Kaline was a great player for many years and finished in the top ten in MVP voting nine times, but he arguably had his best major league season at age 21 and never won an MVP (I’m not suggesting that he should have won it in the age 21 season, only that it may have been his best chance). Mike Trout could be a slam dunk Hall of Famer and yet never match his 2012 season. * Finally, there is the issue of a margin of error in RAR/WAR calculations. Let’s just assume for the sake of argument that the 95% confidence interval on RAR is 15 runs wide (I pulled this number completely out of thin air, and am just using it to make a point; of course, a 95% confidence standard is also pulled out of thin air despite its ubiquitous application in statistics). So I have Trout at 81 RAR and Cabrera at 78, not considering fielding and baserunning. Let’ s suppose that Trout was worth 9 runs in these areas to give him an even 90 and that Cabrera was worth -3 for an even 75. Obviously, I’ve engineered this example so that they are separated by 15 runs. So to put it in stats lingo, we cannot, at a 5% significance level, reject the null hypothesis that Cabrera and Trout were of equal value. So if you believe that Cabrera was as valuable as Trout, it is a defensible position. But saying that we can’t be confident at the 5% significance level that Trout was more valuable than Cabrera does not change the fact that our analysis indicates that it is highly likely that Trout was more valuable than Cabrera. What I’m trying to get at here is that there is that I sometimes detect (perhaps incorrectly) in the arguments of folks who like to harp on a margin of error that 1) if the confidence intervals overlap, then you cannot use RAR to make the case that Trout was probably more valuable and 2) that in lieu of airtight evidence that Trout was more valuable, you should go with Cabrera. Maybe I’m imagining this, particularly the second, but that is the impression that I was left with after reading some discussions. Of course, the proponents of the pure confidence interval approach need to be cognizant of the logical conclusion of their arguments--if we can’t argue for Trout ahead of Cabrera on a ballot on the basis of his higher RAR, we also can’t argue for Cabrera over Robinson Cano or Justin Verlander, because our confidence intervals on their RARs overlap with Cabera’s. It would be nice if a MVP ballot was constructed in such a way that you didn’t have to assign a strict rank order. It might be a better system if you could give Trout the equivalent of a 1.2nd place vote, and Cabrera the equivalent of a 2.5th place vote. It might be a better system if you could somehow throw a net over Trout and Cabrera on your ballot, and then throw another net over Cabrera, Verlander, and Cano, and then another over Verlander, Cano, David Price, and Adrian Beltre. But that’s not how the system works--you have to make a rank order, and all the margin of error tells you is that it’s not crazy to think that perhaps Cabrera was as good as Trout, and that you’re not an abject idiot for putting Cabrera first. It doesn’t do much to convince anyone else to follow suit, though. Given the way MVP voting is constructed, I am going to vote for a guy with 76 RAR over a guy with 75 RAR every time unless I can be convinced of a reason not incorporated into those figures to do otherwise. I say this even though one run (or an alternatively small quantity) is a meaningless distinction--the ballot structure forces one to make meaningless distinctions, and just parroting your value estimates is no less arbitrary than any other way of making those distinctions (and at least allows for consistency in lieu of confidence). You would never know it from the clash of worldviews offered by the AL race, but the NL MVP race was much closer, and there are three candidates between whom it’s tough to make meaningful distinctions. My figures credit Buster Posey with 77 RAR, Andrew McCutchen with 75, and Ryan Braun with 74. Posey’s RAR is inflated since he’s considered a full-time catcher, but the evidence seems to suggest that he is a solid enough catcher and not a disastrous baserunner. McCutchen does not fare all that well in fielding metrics, while Ryan Braun is considered a solid left fielder. Seeing no reason to knock Posey down, I put him in the top spot, but I would certainly accept an argument on behalf of any of the three. With so little to separate Braun and McCutchen, I chose to go with the one who fares better in the area in which I’m more confident in our value estimates--offense. Braun created 6 more runs in just 3 more outs, a difference well within a margin of error but also the largest daylight you’ll find between these two. There are a number of interesting position player candidates for the remainder of the ballot. The two closest position players are a pair of third basemen, Chase Headley and David Wright. Headley is ahead in RAR, 68-61, but fielding metrics suggest that Wright may have been better. UZR really liked Wright’s fielding at +15 to Headley’s +2; Baseball Prospectus’ FRAA was less enthusiastic about both (Wright +1, Headley -7). I’ll side with offense and keep Headley ahead. In the American League, though, I think the Cy Young choice in 2012 is easier than it was in 2011, when Justin Verlander’s 24-5 record propelled him to a unanimous Cy Young and a MVP award. And once again it is Verlander on top of the ballot. He led the AL in innings, eRA, RAA, and RAR, and was third in RRA and second in dRA. The second place finisher in RAR was David Price, who led the league in RRA. But he pitched 27 fewer innings than Verlander and his RRA was only .16 runs lower, giving him 67 RAR to Verlander’s 72. If you use a higher baseline, it’s naturally closer--Verlander's RAA lead was 39-38. Verlander and Price were very close in both eRA and dRA, but in each category Verlander had a narrow lead. Verlander also had a narrow edge in strikeout rate (9.5 to 9.1) and walk rate (2.4 to 2.6). Price is close enough that I wouldn’t dismiss a case made on his behalf (that Price led the AL in QS% 81-76 over Verlander would not be the way to start that case)--but I wouldn’t make it myself. I didn’t adjust these figures for league scoring context, but the NL average R/G was 4.13 in 2011 and 4.22 in 2012, so it would make little difference. In 2011, Kershaw won the real award, but was edged out on my ballot by Roy Halladay. This year, RA Dickey was second to Kershaw with 60 RAR, and I would love to find an excuse to elevate the knuckleballer to #1 on my ballot. But I can find no such reason. Dickey’s eRA was .42 runs worse than Kershaw’s, his dRA .35 runs worse. Much closer is the second-place choice between Dickey and Johnny Cueto. Dickey’s edge comes from his sixteen additional innings as Cueto had a better RRA and they were very close in eRA (3.43 to 3.49, Dickey) and dRA (3.69 to 3.72, Cueto, with the caveat that knuckleballers and DIPS don’t play nice), so Cueto’s injury was the only thing stopping him from earning the second spot on my ballot. A quick word on relievers, since Fernando Rodney and Craig Kimbrel will garner a fair amount of Cy Young votes (although we now know that neither finished in his league’s top three). First, both had outstanding seasons and ranked as the top relievers in their league in RAR. It’s quite common for a non-closer to lead the league in RAR thanks to pitching more innings, but Rodney’s .73 RRA in 75 innings was good for 35 RAR (Kelvin Herrera was second with 25), and Kimbrel’s .84 RRA in 63 innings for 27 RAR led NL relievers (excluding teammate Kris Medlen, who with less than 15 starts was classified as a reliever in my stats; Aroldis Chapman was next with 25). WPA and associated metrics (like LI) are based on a real-time perspective on value. A real-time perspective on value is quite valuable, as it is what the participants in the game actually face at any given time. But since estimating value is by its nature a backwards-looking exercise, I don’t see any reason why we should feel constrained to measuring real-time value. After the game is over, it is clear that each run was equally important (absent the effect that it had on future strategic decisions, any emotional/psychological effect, and the like), regardless of how it appeared at the time. A run-scoring play in the bottom of the ninth of a 1-0 game will almost certainly have a higher WPA than the same play in the bottom of the first. But both were equally essential to the game’s outcome, and looking back after the fact, I don’t feel bound in the slightest to give more credit to the former. So I believe that elite relievers do in fact deserve credit beyond what their non-contextual stats would indicate, as they log a higher percentage of their work in high-leverage games (that is, close games) than starters. But their leverage indices from an ex post facto game perspective would necessarily be less than their leverage indices from a real-time perspective--and the former are barely high enough to push them into the Cy Young conversation. Over the next few weeks I'll be posting the ballots I cast (with some explanation) for the Internet Baseball Awards sponsored by Baseball Prospectus (and held in memory of the late Greg Spira). The American League Rookie of the Year race is not particularly interesting to discuss. It wouldn’t even be that interesting to discuss if it was a vote for Rookie of the Decade. If it was Rookie of the Century, that might be a fun debate. There’s no hyperbole here--Mike Trout was that good. The down ballot for any award is always a lot less interesting than who you choose for the top spot, but when you are engaging in a vote with a group of people, it’s important to still take it seriously in order to preserve the integrity of the vote (of course, the IBAs are voted on by a large enough pool that you can safely assume your vote will have no impact on the outcome…sort of like another vote in the news). In theory, though, your fifth place vote can help determine who ends up winning. But that nagging sense of responsibility is not strong enough to stand up to a slam dunk vote. Trout will be ROY, and no one really cares about who finishes second or third in the ROY vote, as opposed to the MVP where there is mild interest. I believe that I have deviated a bit from the consensus by slotting Jarrod Parker second. Parker pitched just ten fewer innings than Yu Darvish, and he leads him in RRA 3.51 to 4.16, resulting in 11 more RAR (44 to 33). Darvish does perform better in eRA and dRA, but my primary consideration for pitchers is their actual runs allowed rate. Parker and Darvish look much closer in terms of RA than RRA (Parker’s lead is 3.50 to 3.91), but Darvish received the best bullpen support of any AL starter. He bequeathed 25 runners, but only 2 scored, five and a half fewer than one would expect. Parker was on the poor support side with 7 of his 18 bequeathed runners scoring (2 more than expected). The only other position player in the mix (Jarrod Dyson ranked second in RAR among AL hitters) is Parker’s teammate Yoenis Cespedes. Cespedes had a fine season with 36 RAR, but the fielding and baserunning numbers don’t suggest a big shift, and so he only comes out as the A’s second-best rookie. The NL race is competitive, although if you insert any sort of future projection/historical significance/age factor into your thinking, it becomes a runaway as well. I don’t though; I attempt to make an honest evaluation of each player’s value for the season in question and use that as the criteria for my ROY ballot. I might allow those considerations to seep in if it’s a virtual tie and one player clearly has the edge in the other factors. During the summer, as Todd Frazier surged and Bryce Harper tailed off, it appeared as if Frazier might pass Harper as the NL’s top rookie hitter. But Frazier got inconsistent playing time in September and Harper blew by him with a 39 to 28 lead in RAR. Norichika Aoki (27), Yonder Alonso (26), and Wilin Rosario (25) were in the mix as well. However, Rosario’s fielding appears to have been dreadful behind the plate, and it’s tough to move Alonso up on the basis of fielding and baserunning. Aoki versus Frazier is closer; Frazier’s RAR figure treats him as a full-time third baseman, but he played about a third of his games on the other corners. In the end, I kept Frazier ahead, but you can certainly argue the other way. Wade Miley is Harper’s closest competitor, compiling 40 RAR in 195 innings. His peripherals (3.73 eRA, 3.72 dRA) were a little less impressive but by no means out of line with his 3.35 RRA. Harper’s 39 RAR don’t give him any credit for fielding or baserunning, though, and most metrics indicate that some is due to him. I think that you can make this case without letting age seep in.